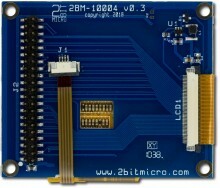 3.5" diagonal TFT LCD module with touch panel and interface breakout board. Includes current driver for the LED backlight present on the TFT LCD module. Click the button below to add the 3.5" 320x240 QVGA TFT with Interface Board and Touch Panel to your wish list.